Another process showing how I take a sketchbook drawing through to colour in Photoshop. I was on a plane when I sketched this cool girl. Thought I'd show you how I take my sketchbook doodles through to a final digital illustration. First I begin in my sketchbook, drawing random things, hoping something interesting will come out. 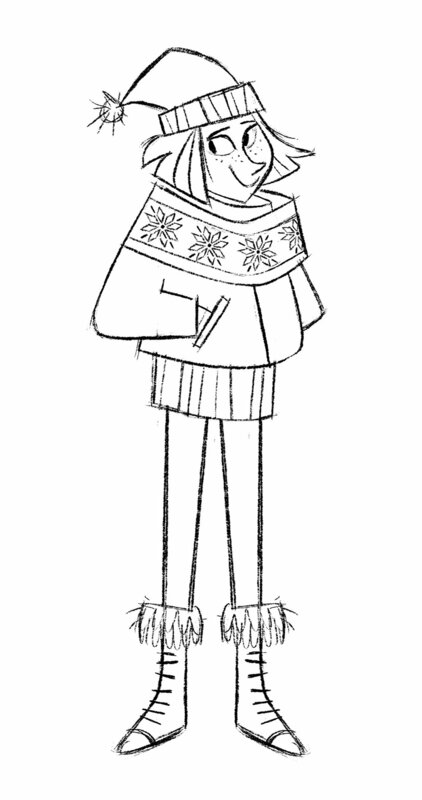 It's quickly turned to winter where I live and everyone is flooding the coffee shops in their winter wear for the holiday drinks! Final steps, I add some layer filters to capture the warmth of the scene. Et voilà! C'est fini! Took this beautiful frosty Sunday to test the new Starbucks holiday drinks and doodle the afternoon away! Will be cleaning some of these up very soon! You have a fox, a chicken and a sack of grain. You must cross a river with only one of them at a time. if you leave the chicken with the grain he will eat it. How can you get all three across safely? I recently met up with another illustrator in my area who I met through the SCBWI Canada East chapter. We talked of many things, including our online presence. 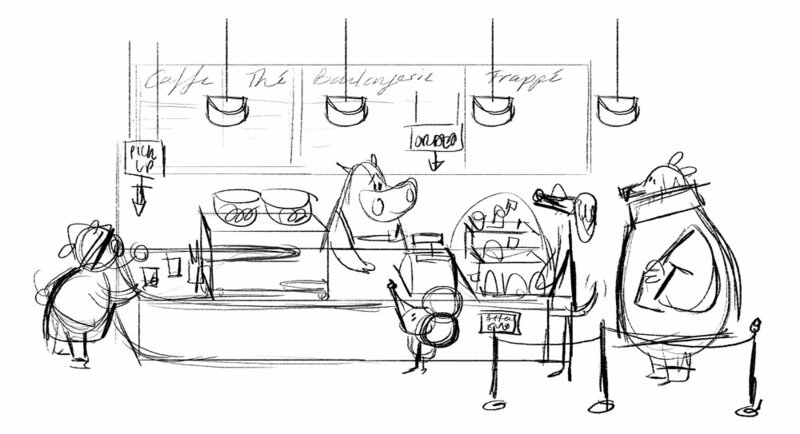 I've been using social media and blogs for years now, always in relation to my animation work. For my illustration work, I decided to take a different direction and really control and limit the amount of work I show. The conversation we had really opened my eyes to the fact that I wasn't showing all the work I normally would show if it were for animation. My friend has encouraged me to post more of my sketchbook drawings. Napanee, Ontario, Canada: Birth place of Avril Lavigne, my idol when I was fifteen to twent... I mean, seventeen.... And also the location of the picture book workshop I attended last Friday, hosted by SCBWI and lead by author Alma Fullerton. I was lucky to have a glimpse of Alma's workshop crammed into a 30 min presentation last May at the Montreal conference but last week I got to spend several hours with her and 10 other budding writer/illustrators going through her pacing structures and answering all of our questions. Although she was very kind about my dummy book and only suggested changing the ending, after taking her workshop, I realised I need to overhaul about 50% of this dummy book and with pleasure! Because to be honest, when I wrote it, I really had no idea what I was doing! So here I am, back to the drawing board and turning it inside out and upside down and back to front to see if I can create a more engaging story. And my biggest revelation... a wordless book! I aint no wordsmith, that's for sure, so why try to be? I can still tell my story, the way I know best from my animation experience, through the visuals alone. Let me introduce you to one of the characters from my book... Box. Stay tuned for more updates on the characters from my book What's In The Box? Several months ago, I heard of a society designed solely for people who want to make books for children. I did a whole blog post on this a while back, have a look HERE. But in May, I experience my first full blown professional illustration conference in Montreal. So with my business cards, postcard, portfolio and dummy book in hand, I went to the hotel hosting the event for a portfolio display on the first night. It was great being in a room of dedicated illustrators and seeing what other talent was being grown around Canada East. I felt like a proper profesh. The weekend was great! I met lots of people, authors, illustrators, agents, editors. I feel like I've learnt a lot about the process and who does what! Now I need to scrap everything I've done and start again! My first illustration conference is coming up at the end of this month so I'm in full swing, preparing new promotional materials and my portfolio. It feels like this is my first proper big step into the crazy world of children's book illustration. Actually meeting with real adults, the people who decide whether you have what it takes to get hired as an illustrator or if you don't. The stress of choosing the right image to go on your business cards and postcards! It's hard to choose something that is eye-catching but not too over the top or busy. Hopefully, this design will pop out amongst the sea of talented cards at the event. If that goofy stare doesn't do it, then I don't know what will! At the beginning of my journey into the world of Illustration, I didn't really know where to begin. I had spent the last several years getting savvy with the animation world, how to connect with other animation artists and even giving advice to younger artists taking their first steps in the animation world after graduating. Then suddenly, I felt like I was just graduating! I had some skills that I'd picked up along the way as a character designer and art director but I had no idea how or where to use them! When I moved from London to Canada in early 2016, I pledged to myself that I would make more time to figure out how I was going to start this illustration thing. 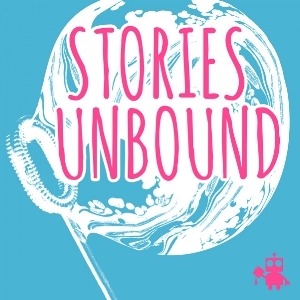 Through listening to many podcasts on iTunes, I came across the Stories Unbound podcast, via the Oatley Academy. I was familiar with Chris Oatley's site and ArtCast from working as a character designer but it seemed I had missed Shawna JC Tenney's one! It was, and still is, a fountain of knowledge and inspiration for me starting out in this new world. It was through Shawna's podcast, that I first heard the letters S-C-B-W-I. The Society of Children's Book Writers and Illustrators is a one stop shop for everything children's book illustration! Shortly after I heard of the organisation, I Googled them to see if there was a group in my area. Lo and behold, there was a meeting in a few weeks time, in my city! So I went along with some of my early 'What's In The Box?' artwork and the reception I got was one of great generosity and positivity! The group were kind enough to look through my work and encouraged me to send it off as soon as possible! It was great to have that boost of confidence from artists and writers who had been in the industry for some time but I still wanted to take some time to finish off my dummy book and create more art for my illustration portfolio, to create something separate from my character design portfolio. So that is what I have been doing over the last few months. It's been great taking part in the competitions and hashtags SCBWI promote through social media and their website. Today I sent off my first entry into the #SCBWIDrawThis competition! The prompt given was 'MARCH'. See image at top of this post! Every day is women's day in my world because I am a human woman. Every day I try to find stories of how women and men across the world are fighting for equal rights for the different sexes. It's an important fight and I like to see how the industries I am involved with are tackling the subject. As you may know (bcause I've mentioned it a bazillion times on this site!) I have come to illustration from the animation world. Film is my number one love! Being in the cinema watching a new (or old) movie with a fist full of Malteasers is my happy place. I am excited to see more stories of women and people of colour coming to the forefront of our cinema and television, without having to be pigeoned holed into a rom-com or chick-flick category. Hidden Figures was one of my favourite films during this year's award season. It was wonderful to see some, to quote Canadian comic, Katherine Ryan... 'Strong, Powerful, Beautiful, Black' women, not to mention genuises, on the screen. The film industry still has a long way to go to achieve equality, with only 7% of the Top 250 films of 2016 having been directed by a female. International Women's Day is a great time to acknowledge the disparity in equality across industries not to mention across the globe, socially and economically. I look forward to the day when we don't need to have an International Women's Day. But until then... Happy IWD! World Book Day 20th Anniversary! This is my first time recognising #WorldBookDay really. SHAME! I hear you cry! But as you'll know already, children's illustration is kind of new for me, even though I've be drawing for children for years but just through the TV screen instead of through books! I love the idea that books have their own global day of recognition, not just for authors and illustrators but for the pure joy of reading! I wasn't a big book reader when I was a child, TV was definitely my main story telling device (shout out to TV, love ya!) but it makes me smile how much my niece Victoria devours books! And now as an adult, trying to make my way in the world of books and watching my illustrator friends, I can understand the importance of them much more and have a found a new respect for them over the last year. If you have a book on the go right now, why not print yourself a nice new bookmark to celebrate today!? This week, I went out on an unofficial sketchcrawl with some of my character design and life drawing students. Trying to encourage them to get out and about drawing in their sketchbooks. Something I try my best to do frequently, but must admit, don't do nearly enough! Since I was little, I was always intrigued by Paul Daniels and other TV magicians. My taste has since matured to the illusions of Derren Brown, but still when I see a 'regular' magician I'm still blown away. This magician is all show though, he's not very good at finishing his tricks! This has got to be one of my favourite #'s on social media. It's so great seeing everyone's design skills and bios about themselves in illustration form. This is the first time I've ever contributed! Did you do one? Can I see it?! Won't you come in and have a cup of tea?! Thank you for stopping by my BRAND SPANKING NEW website! 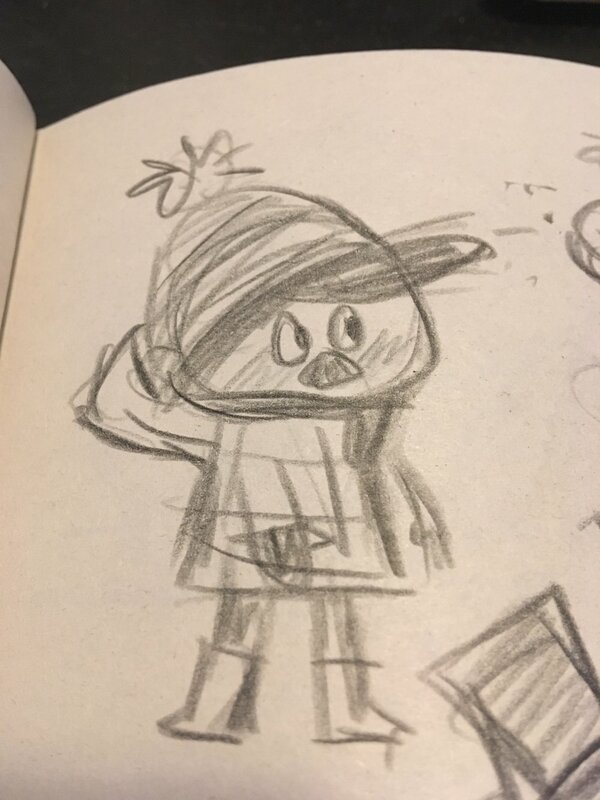 Some of you may already be familiar with my work as a character designer in the animation industry and some of you may have never heard of me whatsoever! But the good news is that that's OK, cause I have a new venture and I've made a lovely website to share my new works with you. For sometime now I have wanted to cross over into children's book illustration (but also keep up the character design work!) and since my recent move from the UK to Canada, it's been possible to find more down time to set all this up! 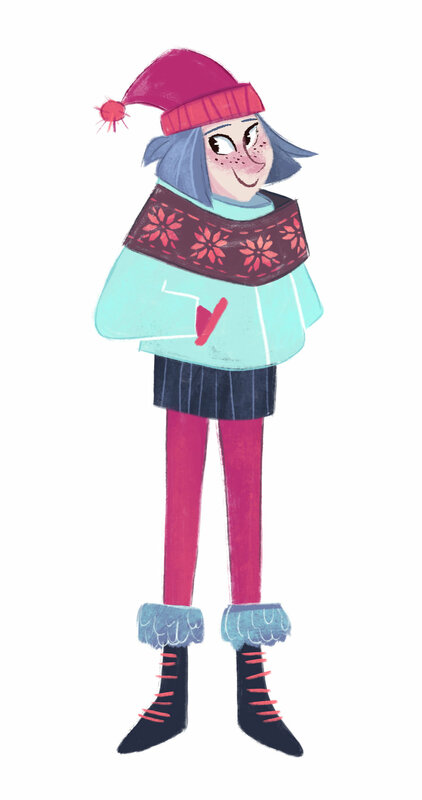 So, I will keep my blog updated with new personal work and any news on finding my way through the illustration world!